Geodynamic flame work of the Japanese Islands. The Philippine Sea Plate motion will cause the Izu–Ogasawara Trench to migrate westward, then T–T–T triple junction, Japan Trench, and NE Japan successively. Thereby, the arc crust of NE Japan has no choice but to shorten its width as it drifts westward. The cause of inland earthquakes along the Japan Sea side of NE Japan is the Philippine Sea Plate, not the Pacific Plate. 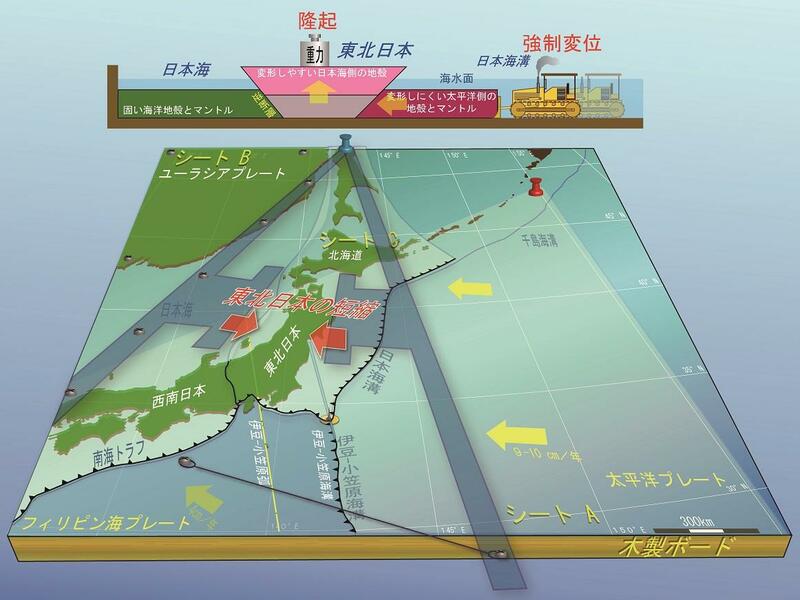 It is the imposed displacement arising from moving subduction boundary of the Pacific Plate (Japan Trench) that causes the E–W contraction of NE Japan, not the Pacific Plate motion itself. Diatoms of the Miocene Wajima and Tsukada formations distributed in Wajima City (Noto Peninsula, Ishikawa Prefecture) were examined. Non-marine lacustrine diatoms are found in the uppermost part of the Wajima Formation. The Tsukada Formation contains middle Miocene diatom assemblages which can be placed between the biohorizons D53 (12.3 Ma) and D54 (11.6 Ma) of the Denticulopsis praedimorpha Zone (NPD5B). An unconformity at the base of the Tsukada Formation ranging from ca. 16 Ma to 12.3 Ma indicates that a land area might be present in the western part of Noto Peninsula during the early Middle Miocene. Northeast (NE) Japan, where the Pacific Plate is subducted to the west, frequently suffers large earthquakes not only along the Japan Trench but also along the Japan Sea side. Those occurred in the former area (subduction–zone earthquake) such as the 2011 off the Pacific coast of Tohoku Earthquake can easily be understood as a releasing process of accumulated stress along the boundary between the subducting Pacific Plate and the overlying plate. On the contrary, those in the latter area (inland earthquake), which occur at relatively shallow depth (<20 km), cannot be explained by such a simple dislocation model. Here I show, the cause of such inland earthquakes can be identified by considering the plate kinematics around the Japanese Islands on the basis of three dimensions, not conventional two dimensions, and the cause of the present E–W contractive tectonics of NE Japan is not the Pacific Plate motion itself but the northwestward–moving Philippine Sea Plate. Izu-Oshima volcano is an active basaltic stratovolcano in the Izu-Mariana arc, and its last major eruption occurred in 1986. This field guide includes descriptions about the 1986 products, the Miharayama Central Cone, the 1421? product at the southern coast, the 1.7-ka caldera-forming products, the pre-caldera tephra formation and the 2013 lahar.